The “cat” cartoon offended their religion. Police broke up a protest today by hundreds of angry Muslims upset over the publication of an offensive cat cartoon. Dhaka, 21 Sept. (AKI) – Police in Bangladesh broke up a protest by hundreds of Muslims in the capital Dhaka over the publication of a cartoon that they say offended their religion. A report on the local newspaper The Daily Star said that several hundred activists of six Islamic organisations began the protest march outside the capital’s Baitul Mokarram mosque after Friday prayers. Bangladesh’s caretaker government suspended the publication, Alpin, a weekly satire magazine of leading Bengali daily Prothom Alo. The magazine’s publishers also apologised and appealed for forgiveness for the drawing. The cartoon shows a small boy referring to his cat as “Mohammad cat”. The image provoked outrage and protestors said that it was a deliberate attempt to ridicule Islam’s Prophet Mohammad. The cartoonist, Arifur Rahman, was arrested on 17 September by the police. The Daily Star reports that the editors from several leading newspapers including Prothom Alo have appealed for forgiveness. The editors urged the country’s religious leaders or ulema to consider the newspaper’s apology and also called for calm and restraint. Paris-based press freedom group, Reporters Without Borders, has called for the release of Arifur Rahman. The demonstrators demanded the execution of the paper’s editor, Matiur Rahman- BBC. Charles Johnson posted the offensive cartoon. 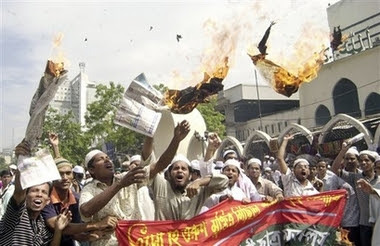 Street clashes have broken out in the Bangladeshi capital, Dhaka, as Islamic activists protested over the publication of an “offensive” cartoon. Witnesses say that hundreds joined the protest, even though such demonstrations are officially banned under the country’s state of emergency. Police baton-charged some of the protesters as they tried to break through barricades. The leading Bangla-language newspaper published the offending cartoons. Prothom Alo has since apologised for them and said that it has sacked an editor. Islam is Bangladesh’s state religion and past governments have banned publications for insulting Muslim. The country’s religious traditions are moderate but some people believe conservatives are becoming more influential. Witnesses say the violence began after Friday prayers, when protesters tried to break through barricades put up to prevent them reaching the Prothom Alo offices. * Boy, what is your name? – My name is Babu. * It is customary to mention Muhammed before the name. * What’s this in your lap? ANOTHER cartoon controversy has hit the Muslim world. But this time, it is not part of the European dynamic made familiar by the 2006 Denmark crisis and its lesser known Scandinavian cousin this year. This time the action is unfolding in Bangladesh, home to the world’s fourth largest Muslim population (after Indonesia, Pakistan and India). And this time, it’s about more than blasphemy. Last month, Bangladesh authorities arrested twenty year old cartoonist Arifur Rahman, on charges of blasphemy and sedition for a cartoon he drew in the satirical magazine Alpin (“pin prick”). In it, he depicts an imam telling a small boy that he should always add the prefix “Mohammed” before a name, which leads to the boy referring to the cat in his lap as “Mohammed Beral (cat).” Islamist parties quickly denounced the cartoon, the government arrested the hapless cartoonist, and the editor of Alpin was immediately fired. Things might have rested there, but the intervention of smaller Islamist groups, such as Hizb-ut-Tahrir, led to demands that the parent newspaper of Alpin, Prothom Alo, be shut down, and its editor and publisher, Motiur Rahman and Mahfuz Anam, sacked. This was no insignificant demand – Prothom Alo is the largest circulation newspaper in the country, and Rahman and Anam two of Bangladesh’s most powerful media personalities. After Friday prayers, Hizb-ut-Tahrir activists burned copies of the newspaper, and clashed with police. Peace talks were brokered between Prothom Alo and religious leaders, leading to a public apology from Rahman to the khatib of the National Mosque. The uneasy calm that followed in Dhaka was threatened by the discovery of another allegedly blasphemous reference in a literary magazine published by Prothom Alo, Shaptahik 2000, by the exiled poet Daud Haider. Worried about fresh trouble, the magazine was instantly pulled from newsstands and banned. The issue is not over yet. Bangladesh has a long history of blasphemy related controversies, starting the year after its independence from Pakistan in 1971. Cultural icons, practices, and language were key motifs in the country’s struggles against Pakistani rule (Bengali poets Rabindranath Tagore and Kazi Nazrul Islam were re-appropriated as “Hindu” and “Muslim” respectively). After Bangladesh’s independence from Pakistan, the culture wars became a key dividing line between Islamist and “secular” (or religious freedom) politics. In this trajectory, controversies targeted blasphemous writings by Haider (exiled in Germany), Taslima Nasreen (subject of global attention after a fatwa and bounty, now exiled in India), Ahmad Sharif (prosecuted in court and forced to apologise) and Humayun Azad (nearly killed in a brutal machete attack, but succumbing to related injuries in Germany later on). In all these cases, electoral politics are often a bigger factor than genuine, widespread religious sentiment. The country’s largest Islamist party, Jamaat-e-Islami, has used blasphemy controversies to bring itself to national prominence, forcing governments to negotiate with them amidst the uproar. Even though Islamist politics were banned in the aftermath of the country’s independence – Jamaat supported Pakistan during the 1971 war and formed death squads targeting leading Bangladeshi professors and intellectuals – Jamaat has been able to rehabilitate itself through these kinds of mass mobilizations. By 2001, Jamaat entered the government for the first time, securing two powerful ministries. Since then, Jamaat has found itself benefiting politically from recurring blasphemy controversies that serve to stoke religious fervor in their political base. In the latest controversy, similar motives may be at play. The current Information Minister, Mainul Hossein (who issued the arrest order), owns the daily Ittefaq, one of Prothom Alo’s rivals. With Prothom Alo’s critical stance against Islamists, it has garnered many sworn enemies. Currently Bangladesh is under an army-backed caretaker government, with a promised transition to democracy in 2008 looking increasingly shaky and uncertain. The military has vowed to crush corruption, arresting the leaders of both main political parties, as well as numerous party bigwigs. But some complain that Jamaat-e-Islami has been left alone in the current anti-corruption drive, because of sympathy within the Army. The manner in which the government gave in to blasphemy demands, and the light touch given to cartoon demonstrators (even though all protests and rallies are supposed to be banned under a “state of emergency”) seems to give further evidence of the caretaker government’s bias.